Jazz is a music of dancing, virtuosity, anger, laughter, and many other things, including color. There is one specific kind of color that I believe is worth considering when we choose where to play those oh-so-spine-tingling blue notes: those notes where we find pitches in-between the notes. I’m talking about the color of harmonic series overtones. This would, of course, be the overtone series for C.
There is also a 14th harmonic Bb in there, which is also 31 cents flat; but for mathematical reasons, it is extremely closely related to the 7th harmonic note, and it’s safe to concede the concept of octave doubling and to consider them essentially the same note. These three harmonics, the 7th, 11th, and 13th, also happen to correspond in jazz to particularly important color notes. I suggest in our practice time, we experiment with de-tuning the notes of the 7th, sharp 11th, and the 13th , lining them up with the harmonic series notes, to observe if there is any particularly strong-sounding color that jumps out. There should be. 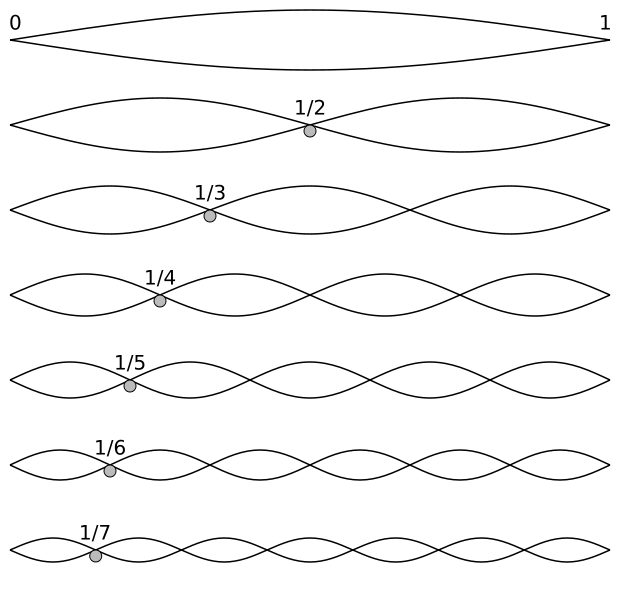 The human ear is constructed to identify intervals that are strongly associated with the harmonic series. Now, let’s do a quick analysis of the blues form. We know that the basic blues form uses the three primary chords: I, IV, and V.
And, of course, we see some of the voice-leading possiblities when adding these harmonic series color notes through the different parts of the blues form. For example, Db- in the V chord easily resolves to C in the I and IV chords. What colors can you find now?